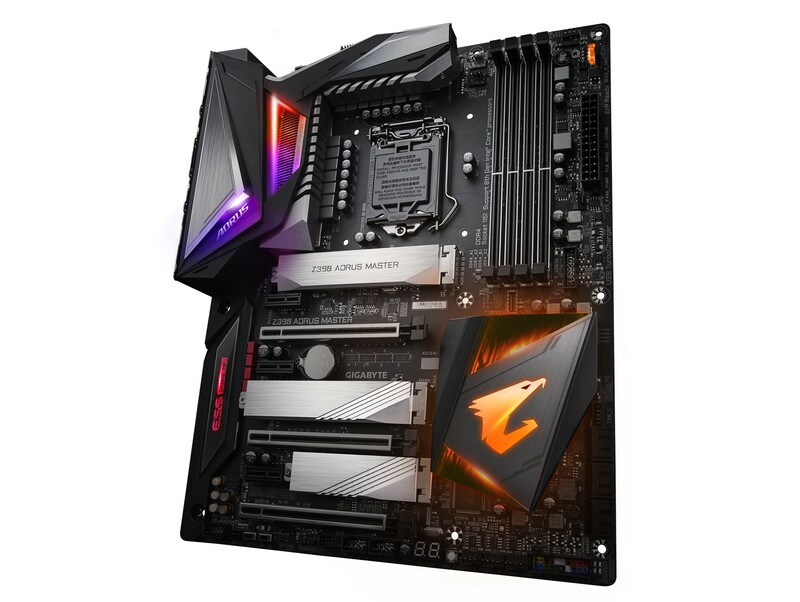 If you love motherboard illumination then you might be a tad disappointed with many of the recent Z390 boards including Gigabyte's; gone are the days of Christmas tree-esque PCBs in its Aorus range of boards and in its place is some more refined RGB lighting that focusses on logos and chipsets. It's a welcome move for many, although the result is that Gigabyte has lost its ability to burn itself into your retinas with the spectacular lighting shows on boards such as the Z370 Aorus Gaming 7. As you can see below, the Z390 Aorus Master's lighting is quite similar to other £200-300 Z390 boards, with a couple of RGB zones plus 3-pin addressable and 4-pin regular RGB headers should you wish to expand your lighting setup. 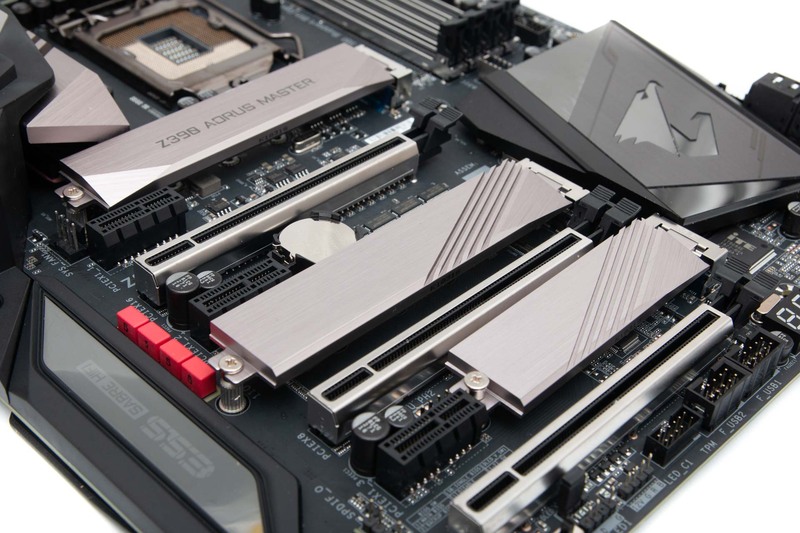 However, Gigabyte probably edges both Asus and MSI with their similarly-priced boards in terms of aesthetics as the Z390 Aorus Master looks awesome in the flesh and is the only one out of the MSI MEG Z390 Ace and Asus ROG Maximus XI Hero to have three heatisnk-equipped M.2 ports. Two of these support both PCIe and SATA M.2 SSDs but all three offer the full PCIe 3.0 x4 bandwidth, although you'll be disabling a few of the six SATA 6Gbps ports in the process as they share bandwidth. The M.2 SSDs are hefty chunks of metal that colour-match the VRM heatsinks that sit atop a 12-phase power delivery, although unlike MSI's MEG Z390 Ace, they just cool the top size of M.2 SSDs using a thick thermal pad. Still, you get more heatsinks than the MSI board and more ports than Asus' ROG Maximus XI Hero, too. You get all the usual overclocking and testing tools with an LED POST-code display and reset button located on the PCB with a CMOS clear button on the rear panel, as well. For some reason Gigabyte still insists on putting the power button here too and this needs to change - you just can't see it unless the I/O panel is facing you. What's wrong with an illuminated on-PCB button? Six SATA 6Gbps ports are all you'll see on most Z390 boards although some use ASMedia controllers to bring the total to eight. We can't imagine this not being enough for most people, though, especially as the majority of cases out there only cater for fewer than four hard disks these days. If you need plenty of USB ports then we doubt anyone will be left wanting from the Z390 Aorus Master, which has a total of nine Type-A ports. Three of these are USB 3.1 Type-A and you get a further pair of USB 3.0 ports along with a Type-C USB 3.1 port plus a header on the PCB if you're lucky enough to own a Type-C-compatible case. You can also see that pesky power button, aerial connectors the onboard 802.11ac WiFi and full complement of audio ports for the Realtek ALC1220 codec.